Cleaning your roof can not only give a fresh look and feel to the home, but it can also increase the curb appeal. When trying to sell a home or when buying a new one, you would always look at the roof to see if it’s in great shape or if it will need some repairing. Roofs that have been taken care of and cleaned regularly will more than likely last longer and be a sure buy. A do-it-yourself job is normally easier said than done. However, with these steps you can clean your roof, increase the value of your home, and be safe while doing it. Prepare the Cleaning Agent – Grab a bucket and mix in the bleach, hot water and roof cleaner. After the detergent granules have dissolved, pour the mixture into a garden sprayer or a pressure washer. Test the Cleaning Agent – Once you have safely positioned yourself on the roof with the sprayer, spray an area of the roof that is roughly three feet by ten feet wide. Let the cleaner sit for about 15 minutes, then return to that section. Scrub the Roof – As you clean each section with the cleaning agent, allow it to sit for about 10 minutes. After the cleaning agent has sat, use a broom or a brush with an extended arm to scrub the area. This should remove any algae or other substance that is found on the roof. Continue to wet the roof as you scrub – Even if you have moved on to another section, keeping the sections that you have already completed the scrubbing process on damp, can help to prevent any substances from flowing from the tiles you are cleaning to the tiles lying below them. Rinse – Rinsing the areas as you go is advised. However, you can wait until you have completed the entire section or side of the roof before rinsing. When you rinse, it should be done with clean water— no detergent or bleach added. The time of day and the weather are important during roof cleaning. To prevent the cleaner from drying quickly, it is best to clean your roof on a day that is overcast, cool and humid. Start at the bottom and work your way up. If you start at the top, where you stand on the roof will always be wet. This can cause you or a loved one to slip and fall. 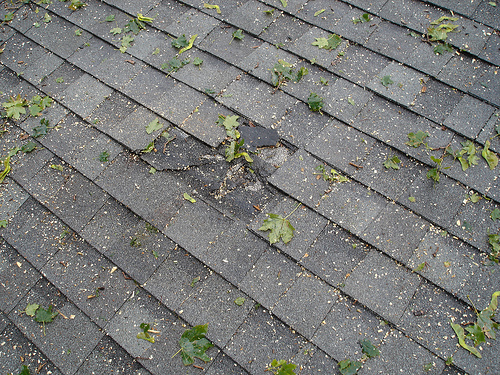 The damages from falling off a roof can be fatal, so please proceed with extreme caution. The brush that you use to scrub the roof may be damaged. It is not ideal to reuse the brush indoors. Once you have cleaned your roof, you may need to repeat the steps on any outdoor buildings that have shingles or other roofing material on top. Roof washing can help extend the lifetime as well as keep your maintenance costs down. If you’re like most homeowners, then you also love the idea of having a roof that is practically maintenance free. Texas Star Roofing professionals recommend a proper roof cleaning at least once every one to three years. When washing your roof, it is important to make sure that you use a low-pressure sprayer to apply the mixture, and are careful to follow all manufacturers’ directions. Roof cleaner can then be rinsed off with water after sitting and soaking for the instructed amount of time. If there is any remaining stains or mildew you can try to scrub or wash off with pressured water. All sorts of stuff can get stuck in your gutters. And the amount of gunk in your gutters will increase after you have washed your roof off. Make sure that you take the time to clean out all debris. You can take the larger debris out by hand, and then use your hose to rinse out the smaller debris. No pressure roof cleaners offer the best way to maintain the integrity & beauty of your home’s most important protector.